Two cute Fallow Deer graze on the green landscape in Les Prairies in Parc Omega in Montebello, Outaouais in Quebec, Canada. 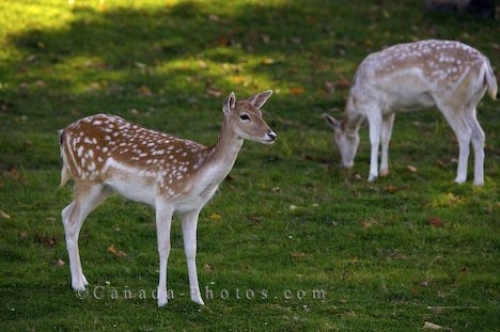 As the leaves begin to fall from the trees in Parc Omega in Montebello, Outaouais in Quebec, Canada, visitors are able to capture two cute Fallow Deer grazing in the grass. These deer are extremely friendly and will approach the cars traveling through the park giving visitors the chance to capture a close-up picture. The white spots on these cute deer are very prominent during the summer months but begin to vanish in the winter, a means of camouflage for these animals. The female species of Fallow Deer, known as a doe, will weigh between 30-50 kilograms with the male or bucks being about 60-85 kilograms in weight. Fawns are born during the spring but the does are quite protective over their young and will keep their distance from visitors during this time. As these cute animals approach your car while on your journey through Parc Omega, visitors should be warned that these are wild animals and hands should remain in the car. Picture of two cute deer grazing in the green pastures in Parc Omega in Montebello in Outaouais, Quebec in Canada. Deer in Les Prairies at Parc Omega in Montebello, Outaouais, Quebec, Canada.